At over 500 million users, Facebook is the largest social platform, and a huge potential channel for web publishers to build their audience, engage with their readers, and expand their influence. However, Facebook is also a primarily closed ecosystem – what happens within Facebook, stays within Facebook – hence traditional web-analytics tools we all use on our websites are of little help. Automate the publishing of your new RSS content to any Facebook Wall or Fan page. Simply tell us which pages you want to see your new content published to, and PostRank will take care of the rest! 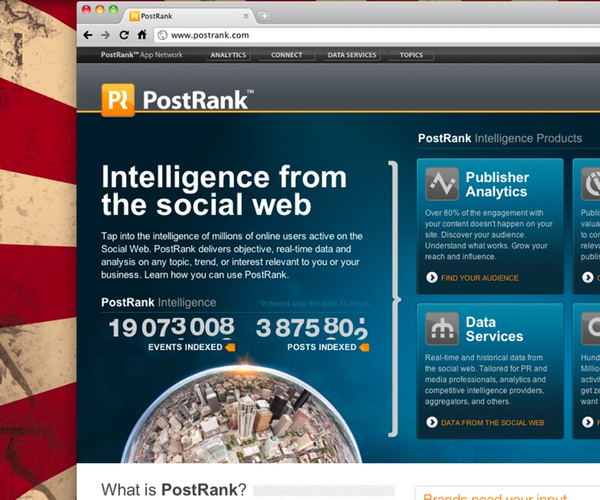 Once published, PostRank will gather detailed analytics on who commented & liked your content on Facebook. via Introducing the PostRank Facebook Analytics App | PostRank Blog. If you’re a PR Connect user you can just edit your existing blog settings to allow not only publishing to Facebook, but also gather data on how your readers and fans interact with your content there. I already have my personal blog set up with Connect, but since I haven’t been posting there much, I’m also claiming this blog to get data on it as well (hence the little icon here for claiming purposes). Once I’ve claimed this site I can have PostRank post articles from here to my own Facebook wall and the TNW Canada Facebook page, then I can also glean information from how people read and share the content on Facebook as well as the information I get from my regular stats. I’ve been a big fan of PostRank since it was called AideRSS and focused mostly on filtering feeds (they still do an awesome job at that), this is just adding another cool thing for me to look forward to getting in my email every morning (when my PostRank stats come in). Read next: For Verizon LTE, it's not "the network", it's the ecosystem.